League Collective Web Design Project by Metal Potato... Let's Do Launch! 23-year old fashion designer and yoga instructor Lilly Richardson had a plan: make environmentally friendly active wear that stands the test of time and reduces landfill waste. She dubbed it League Collective, and it launched with support of 112 Indiegogo donors chipping in £10,000. Lilly’s story is remarkable. 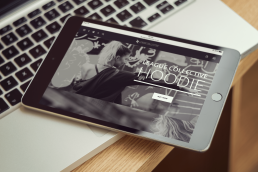 People wanted her product, but with a limited budget, League Collective initially launched with a self-built, Wix website. Within weeks, Lilly’s company had outgrown the website—the quality and finish simply wasn’t on par with her brand’s standards. Lilly contacted us seeking a website that looked polished and high-end. Innovation. We created one of the very first auto-playing background videos capable of being viewed on mobile devices. 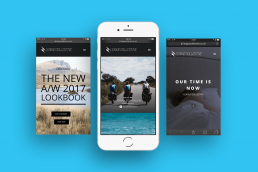 Backed by this cool, key feature, we took a cue from yoga and added parallax image scrolling to give Lilly’s website the smooth, vibrant feel of her sportswear. Like a crow pose, Lilly’s’ menu items feature hover effects. And her bespoke, eCommerce shop breaks traditional moulds with an image-rich, immersive user experience. The end result is a website thats as fit and finished as League Collective’s products. In short, they’re a perfect match. Being the control freak that I am, I found it incredibly daunting to hand my website over to someone else. Metal Potato were an absolute dream to work with. I gave them examples of websites I liked, plus my original site, and from a very basic brief they practically read my mind and created something amazing! They understood the stresses of running your own business, and to combat this feeling of overwhelm, were available 24/7 to answer all my queries and make even the most minor changes within minutes. Incredibly grateful I was able to work with Metal Potato. I cannot recommend them highly enough!